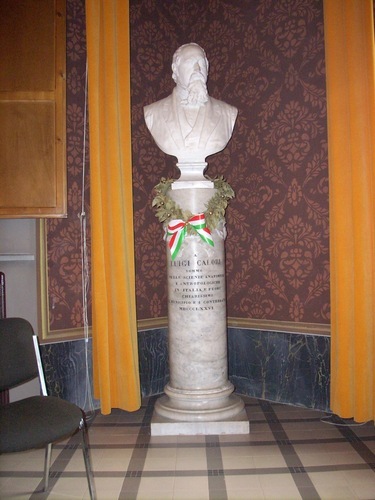 This marble bust of Luigi Calori can be seen in the council chamber of the town hall of San Pietro in Casale (Via G. Matteotti, 154). 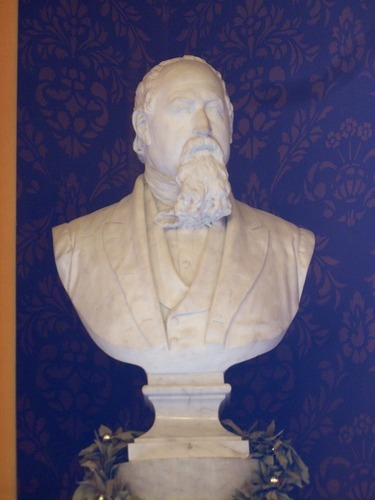 The bust is a work of Italian sculptor Carlo Monari who made it in 18761. On the basament, this Italian inscription can be read: "A / LUIGI CALORI / SOMMO / NELLE SCIENZE ANATOMICHE / E ANTROPOLOGICHE / IN ITALIA E FUORI / CHIARISSIMO / IL MUNICIPIO E I CONTERRANEI / MDCCCLXXVI". 1. See A.Ruggeri (a cura di), Luigi Calori. Una vita dedicata alla scienza, Medimond, Bologna 2007, p. 16.